Having corals in your aquarium can be a pretty demanding job since they require more maintenance than fish and plants. This case is especially true if you’re only a beginner and you’re just entering the colorful world of reef tanks. One of the main concerns for corals is that you need to regularly put salt in your reef tank. But it is not as simple as adding a few tablespoons of kitchen salt, you need commercial reef salt which provides a balanced amount of nutrients which ensure the survival of your corals. What Are The Benefits Of Reef Salt? Now we established that adding reef salt is very important, but why is that? Well, in short, you placed the corals in a closed water system, corals, just as any living being in the ocean requires nutrients. Most of those nutrients are located in the deepest parts of the ocean, but thanks to the water constantly moving, it is present in areas just below the surface. Calcium is in a concentration of about 0.04% in the ocean and it is a crucial element that can be found in liquid and powder form. Mainly clams and stony corals benefit from this nutrient. As they extract the nutrient from water, it provides them the growth they need for their skeleton. And as the corals grow in size, their need for calcium increases. This is an important aspect, so keep track of calcium rates. Strontium is another key element and its benefits are comparable to Calcium. Corals and coralline algae benefit the most, as their growth rates significantly increase with the abundance of strontium. This nutrient can be found in powder and liquid form as well. Magnesium has a bit different benefits compared to previously mentioned nutrients, but it is important as well. It is a key factor for the regulation of PH level as well as the skeletons of various invertebrates. It is available in the same forms as the nutrients previously mentioned, in powder and liquid. This is generally consumed at a slower rate, but always add it if your PH level is getting low. You can choose a ph meter for your tank here. Carbonate boosts the PH level as well as magnesium, but it is very important as a carbon source for many marine animals. Carbonate can be found in both powder and liquid form. Apart from the ones listed above, there are also some minor elements which can be found in sea water, but they aren’t that concentrated. But nevertheless, even though corals can survive without them, they are equally as important as major elements. Recent researching showed us that this element aids the biological processes of many significant bacteria. You can get it in liquid form and you should buy it at some point to avoid outbreaks of cyanobacteria. Iron can contribute and improve the life of corals, plants, and invertebrates since it provides a source of secondary nourishment to the photosynthetic cells. With an abundance of iron, you’re going to improve the growth rate and introduce vibrant colors to these organisms. You can mostly get it in liquid form but it is mostly already added in most salt mixes. Iodine rapidly oxidizes in your reef tank and should be added almost daily in small quantities. If you own soft corals, you need to know that this element is essential for them. Iodine can also have antibiotic properties which can provide a more vibrant color to your corals which will most definitely be an eye-candy. It is most commonly available in liquid form, we strongly suggest you that you avoid overdosing this element and in your reef environment. Reef salt products contain a great range of elements that can help you with the growth process of your corals and of course survival. But in some cases, where the brand is selling a cheap and low-quality product, you may encounter elements which are toxic to your coral’s environment. In this list below, we will analyze these toxic elements and provide their ideal value. Ammonia is a compound of nitrogen and hydrogen that can contribute to the nutritional needs of organisms as a precursor to food and fertilizers. But in its concentrated form, it is extremely toxic and hazardous. Ammonia is a dangerous element and toxic waste in your reef tank, it is commonly let out upon the death of marine life. If you want to ensure the survival of your corals, you’re going to need ammonia to be as close to 0 as possible. Nitrate is a combination of nitrogen and oxygen which is a part of many important molecules.It is commonly used as fertilizer for plants as they need nitrate and potassium to live and grow. But it is to be avoided when it comes to marine life. The same that goes for ammonia goes for Nitrate as well, you want it to be as low as possible, ideally 0 ppm. But in a properly cycled reef tank, the appearance of nitrate levels is going to confirm that your biological filter is doing its job. Most corals tolerate levels ranging from 30-40 ppm. Phosphate is an inorganic chemical and a salt. Inorganic phosphates are mined to obtain phosphorus, which is generally used for agriculture and industry. But phosphate is nonetheless another dangerous element for your reef tank. Be careful and research if the salt mix product contains any Phosphate. This element acts as a fertilizer for algae, so keep its levels down as low as possible, ideally under 0.2 ppm. Nitrite and nitrite derivates should be avoided by all, it is classified to probably contain elements which are carcinogenic to humans. Your bacterial filter will surely create nitrite, but things aren’t that grim. Your bacterial filter will sure produce it as a by-product, but it will also convert ammonia into nitrate, a less toxic form. Same values go for this element as well, keep it as low as possible, ideally at 0 ppm. 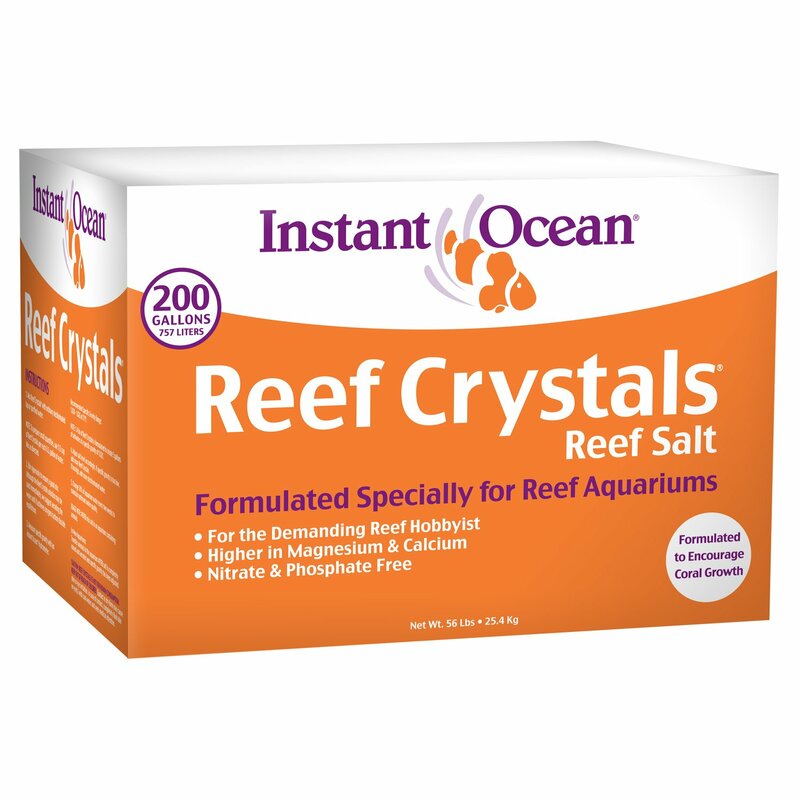 Reef salt from the brand Instant Ocean is very popular and it is used amongst hobbyist and beginners alike worldwide. It has the ideal balanced mix of nutrients that will ensure the survival of both soft and hard corals at an affordable price. This package features a great concentration of calcium along with other extra trace elements. It has a rapid rate of dissolvability as well while being all-natural, this reef salt also doesn’t contain any heavy metals. It comes in a 200-gallon box at an affordable price. It is a perfect mix for small polyp stony corals and coralline algae. Extra calcium for maximum growth rate. Contains trace elements without any heavy metals. Carbonates are at 11 dKH. Calcium is at about 400 ppm. Magnesium ranges at about 1350 ppm. Affordable price even at 200 gallons. Contains more nutrients than usually found in natural seawater. Multiple users reported a brown residue. Red Sea Coral Pro gives you the ideal balance of all major elements needed for a healthy environment for your corals. It doesn’t contain any heavy metals or organic binders due to its unique salt harvesting method. 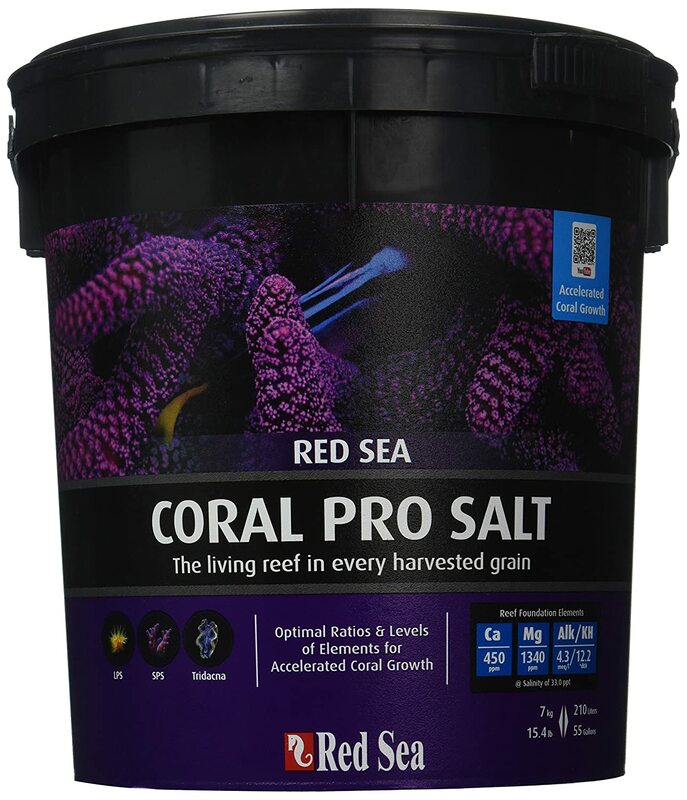 This reef salt is available in a 55-gallon package and it is particularly recommended for growing SPS coral frags. Red Sea’s popular product contains over 57 trace elements paramount for the quick growth of your marine life. Getting this coral salt mix will ensure the best possible coral growth, and even more vivid and brighter colors. Red Sea ensures its quality to its customers for over 20 years. Carbonates are at 12.2 dKH. Takes only 30 minutes to clear up after mixing. Expensive compared to its counterparts. 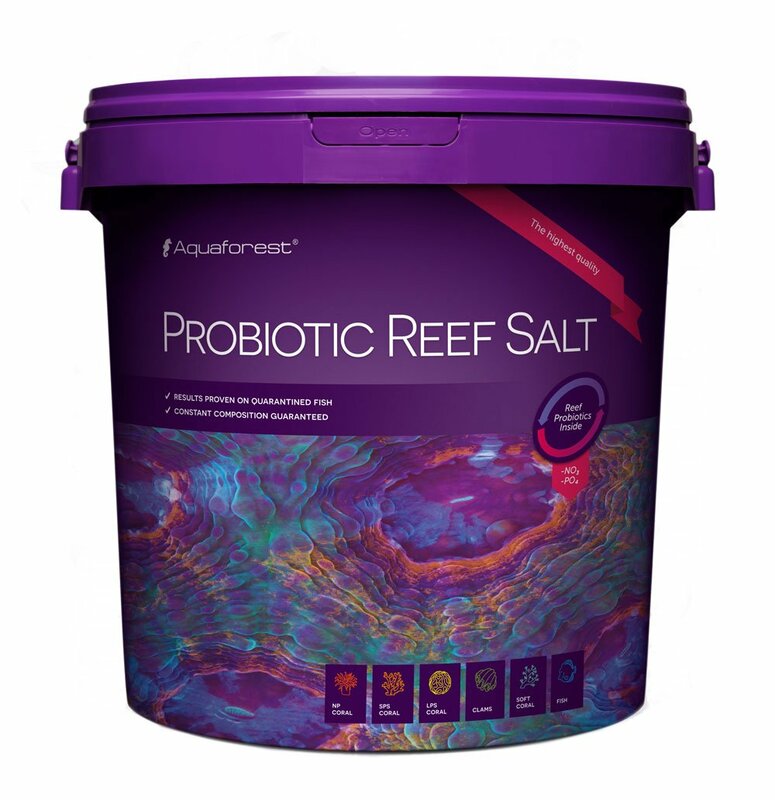 This reef salt from Aquaforest is fully synthetic salt created especially for corals, it was specially designed to give the best conditions for your marine life. 380 grams of this salt is enough to salt 10 liters of water. Depending on the types of corals you own, SPS and LPS corals might profit from the extra concentration of nutrients from this reef salt. Helpful bacteria are also included, you benefit from the reduction of both nitrates and phosphates, also inhibits pathogenic bacteria. AquaForest is surprisingly a Polish brand, nevertheless, it is one of the most popular brands in Europe. Carbonate levels range from 6.5 to 8 dKH. Calcium goes from 410 to 440 ppm. Magnesium ranges from 1230 to 1320 ppm. Adds a vibrant and bright color to your corals. Expensive compared to other brands. Buyers report that not enough salinity is provided. 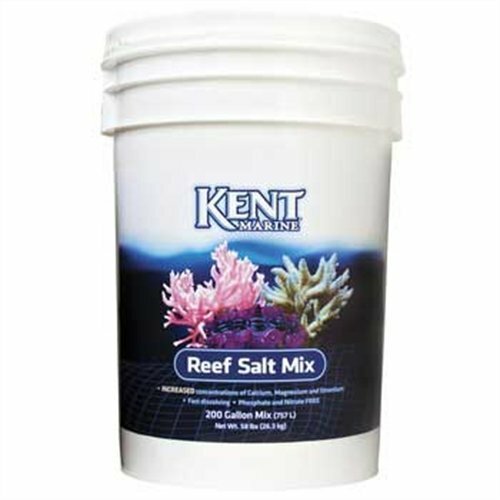 Kent Marine’s reef salt mix provides you not only the nutrients needed for the survival of your marine life, it is also built to help them thrive in their artificial environment. With its Cora-Vite technology, it gives the corals a marine environment unmatched by any other product. Kent Marine may be an underdog as a brand, but it is serving you the care and nurture that your corals need for over 15 years. It is sold in both bucket and box variations. Carbonate levels at around 10.2 dKH. Calcium at around 475 ppm. Magnesium at around 1400 ppm. Comes in 5.3-pound buckets and 58-pound box. More calcium, strontium, iodine and vitamins than other brands. High growth rate for corals. Some buyers reported unbalanced amounts of nutrients. 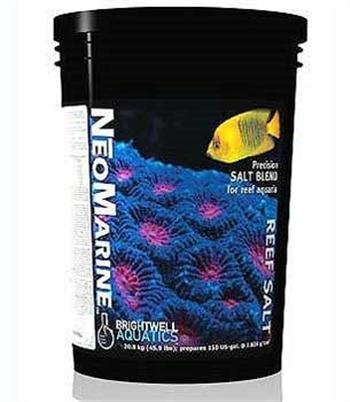 This popular reef salt mix by Brightwell Aquatics is a United States product which is safe, effective and provides the best results. It is a precision-formulated and extensively researched and tested over many years, specifically designed to replicate natural ratios of every ocean’s major nutrient elements. Every batch is carefully analyzed and sampled for quality control, made in a process that provides a dry blend. Saltwater conditioners made by Brightwell Aquatics are recommended to be bought with this product. Carbonate levels at 11 dKH. Calcium ranges at about 420 ppm. Magnesium ranges at about 1380 ppm. Comes in a 150-gallon bucket. All nutrients are quite balanced. Great if you need to resolve pH issues. To conclude this guide, reef salts are generally cheap and with the amounts it is sold at, it will probably last you a while before you use it all. The great characteristic of these reef salts is that they are not only essential for your Corals, they can also boost the growth of them. We have named a few brands and almost all of them have a family-friendly budget, but which one should you really choose? All of these brands are equally good and all have some pros and cons of their own. But the most dominating product both in terms of popularity and quality is certainly Instant Ocean. It has extra calcium, a metal detoxifier and comes at a very affordable price. Brightwell Aquatics Neomarine is another product which has a great balance of nutrients like calcium, magnesium etc. It has good reviews and users have recommended it very highly. But whichever product you buy out of this list, know that it don’t damage or ruin your corals. It is only no-brand and low-quality reef salt could potentially do that. Now go on and buy some, it is time to finally give your corals those long-needed nutrients!